Sage-grouse is a beautiful species of bird that makes its home in the sagebrush sea of the North American West. With up-close and captivating images that have never been documented before, this book, “Sage Grouse: Icon of the American West” introduces this unique and remarkable species and the land they depend upon. Once common throughout the North American prairie, the dances of grassland grouse are known to nature lovers as one of the most impressive wildlife display in North America. A new book by award-winning photographer, Noppadol Paothong, and noted outdoor writer, Joel M. Vance, strives to rescue grassland grouse from the brink of extinction by showing the world what it stands to lose if these species are allowed to disappear forever. 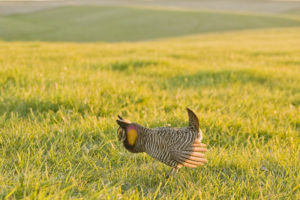 The prairie-chicken has become extremely rare and extirpated over much of its range. Prairie-chickens prefer undisturbed tall grass prairies. They are known for their elaborate courtship dances they perform in hopes of attracting females. The Sage-Grouse is the largest grouse in North America. Its range is sagebrush country in the western United States and southern Canada. Their current population is less than 10 percent of historical numbers. The Sharp-tailed Grouse are one of the larger prairie grouse. They have sharp-pointed tails which stick straight up when they are displaying.